In this interview, Sam Baker discusses collecting vintage Ford cars (Model T’s and A’s), Ford porcelain signs and other collectibles, and Petroliana (gas pumps and globes), especially Richfield. Based in Oceanview, New Jersey, Sam can be reached through his website, Jersey Vintage Ford Collectibles, which is a member of our Hall of Fame. I’ve always had an old Ford Model A or something to tinker around with or play with. It may not have been on the road but I was always building or working on something. Around 1975 I bought a Model A that me and my wife were going to restore. I started working on it and went to Carlisle, Pennsylvania to a car show to look for parts. That’s when I saw my first Ford sign. It said Genuine Ford Parts, it was a painted sign, and I bought it. From there I started buying Model A related items and then I progressed into the early V8s. 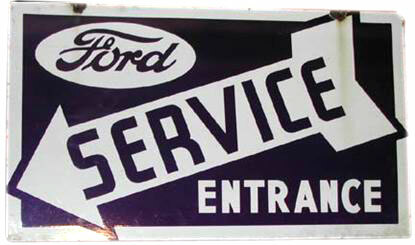 Ford Service Entrance porcelain sign from the 1930-40s. Fords from 1928 to 1940, that’s the era that I collect most. I like the classic Ford design from that era. That’s the era people collect more than any other car, other than the Mustang, because of the design. They’re the favorite cars of all hot rodders. Also, there are more repro cars made out of fiberglass and loose steel from that era than any other car. It started in California, and right now there are not enough of these cars to go around. So they’re reproducing them in fiberglass and steel and then people are putting big engines and stuff in them. Fords were the car of the average man, there were plenty of them. They were easy to work on, you could always get parts for them, even today if I need a part all I’ve got to do is make a phone call. Any running part or even body parts, whereas with other cars you can’t, you have to have a part made. With an old Chrysler or Pontiac from that same era, you can hunt for years to get a part. On the East Coast we tend to like Model A’s especially. The real old collectible stuff is Model A’s. Then if you get modern you go up to like ’65 when the Mustang came out. Mustangs are real big. Collectors Weekly: What specific cars do you collect from the 1928-1940 era? Baker: I have a ’32 Ford V8 Roadster, a ’34 Ford V8 Cabriolet, a ’36 Ford Cabriolet, a ’34 Ford Panel truck, and a 1930 Model A Panel truck. Two of them are restored, and the other ones were like barely running and need work. I do all the work on them. They may not be perfectly restored cars, but they’re going to be good parade cars when I am done with them. I do everything original, but I like so many different cars, and I haven’t got the money to restore them perfectly. But I want to make good drivers out of them, put them on the road and enjoy them. Plus, I have a sign collection, and a collection of Ford literature, you can’t collect everything! After I bought that first sign, I saw some old advertisements for Model A Fords and started buying them and just kept buying more and more and putting them away. I didn’t pay very much for them but boy in four or five years that stuff just doubled and tripled in price. The literature goes up faster than the other stuff. Then I started buying more signs and more literature, like owners manuals. I also buy sales brochures. One of the biggest collectibles is Ford Dealers Showroom Albums, the big hardback books they had for each year. They would keep that in the showroom, and then get rid of it at the end of the year. Real hard to come by because there are only a few of them. I go to the big Hershey, Pennsylvania show in the fall where there are 12,000 dealers selling all kinds of car parts. The shows up there are unbelievable. I also go to small auctions. But at Hershey’s every year I get something good, you never know what you’re going to find. Also, in my area, there are a couple of car clubs and people meet different times at different diners and have breakfast, and we go to each other’s houses to see what each other is working on. We help each other, it is a good activity. There are Ford collectors all over the country, it’s a big hobby. It’s probably bigger on the West Coast, because you have so many hot rodders. Its been a big thing in California for the last ten years, and now it is really starting to pick up here on the East Coast too. Collectors Weekly: What do you mean by hot rodding, exactly? Baker: Collecting Flathead Ford speed equipment it is becoming real big. Like the high compression aluminum heads, and the carburetor manifolds with three and four carburetors on it, that kind of stuff. Different gears and stuff to put in the car. Drag racing started on the West Coast around 1948-49, and on the East Coast in the early ‘50s, so we are way behind. But people are just starting to collect stuff from the drag strips now, the early stuff. Its just starting to catch on that this drag racing stuff is collectible, it ain’t junk anymore. Collectors Weekly: What is the difference between the Model A’s the Model T’s? Baker: A Model A had a regular transmission, and you could get into it and drive. Of course you could only go 45 miles an hour, but you could at least stay on the road. The Model T has a belt drive, sort of like an automatic transmission, and they would only go 25 or maybe 30 miles an hour. They had hardly any brakes, so just the safety aspect, they’re pretty bad. You can’t take it out on the road, somebody would run you over. You can’t drive it at night, it has lights but you can’t even see them. It’s really the uniqueness of stuff that I like, really neat mechanics, all of these gears working. I always want cars you could at least drive on the highway. If you are putting a lot of money into something, you want to be able to drive it. The T’s just are not practical. You would have to put it on a trailer and tow it around, just for show. A lot of people would probably even bypass the A, because they want to go 50 or more miles an hour, so they’ll go for the Ford V8, which came out in ’32. With a V8 you can go 50. You may not be able to stop that great, so you still have some risk. There are all kinds of different Model A’s, like two-seater coupes with a rumble seat. Roadsters where the top comes down, and then two-door sedans with a front and back seat. They also had a four door sedan, and the same thing for the V8’s too. The most popular among collectors would be the Roadster or the one called the Cabriolet. The roadster is really nice, but a true Ford Roadster never had windows, just flat ones like plastic for windows. The Roadster, even though it was the most popular it was the cheapest model. The Cabriolet is a convertible and it had windows that went up and down. Of course it was a lot more money, its the money car, better and a lot rarer. They didn’t make that many of them, because 1929 was the stock market collapse you were in the Depression in the early ‘30’s and stuff just wasn’t selling. People bought the cheapest thing they could. Collectors Weekly: What are some other favorite items in your collection? 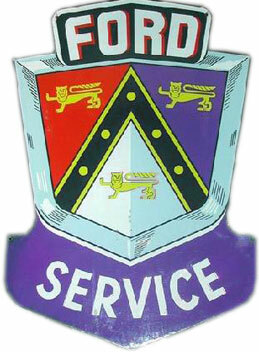 Ford Service Crest with Lions porcelain sign from Europe. Baker: I have a porcelain Ford V8 sign which came out in 1932, and a neon genuine Ford parts clock, those are two of my favorite things. My favorite car is the 1932 Ford V8 roadster, that’s all restored. I have a few earlier signs back into the Model T era, those are some real nice signs. And I have half a dozen that are newer than the ‘40s. Once you get past the 1940s some of them are just painted metal signs, not porcelain. I also have some signs made of tin that have light bulbs inside them, with holes punched in the tin where the light comes out. That was just a cheap sign that Ford put out. But the majority of them are all porcelain. I specialize in the porcelain signs. Mostly over the years the Ford logo has stayed the same, just the Ford oval. They added things, they put a V8 below it for a couple of years. In the Model T era they had wings that had Ford on it, and it was called “Ford the Universal Car.” That was on the real early Model T signs, but then basically they stuck with the Ford oval even right up until today. Back then it used to be a little rounder, now it is more elongated. In terms of the signs, historically, the better advertising went to the big cities first, Chicago, Philadelphia, New York. There were just more dealers here in the East than out in California, and when Ford first started, they had more advertising signs. But in the early days of collecting, the people in California got the jump on buying those East Coast signs. By the time we started buying, they’d already run the price up. Same with gas pumps, by the time I started buying, all the good gas pumps were already taken out in California. Here I am buying them back, so I’m paying a premium price. Collectors Weekly: What about your foreign signs? Baker: I collect any that I can get, mostly off of eBay. I’ve gotten some foreign ones at Hershey’s because parts people from Europe come over. There’s one guy from Sweden I meet every year and I usually buy a sign off of him, or trade him American signs for a foreign sign. I’ve got three or four from Germany, some from Belgium, two from France, one from England, one from Italy, and two from Argentina. I bought my European ones years ago when we first got on the Internet, with Web TV, before we even had a computer. Now of course the price has gone up and European money is worth so much more than ours. I could sell them right back to them, they want them back. When the Internet first started the Europeans didn’t want the vintage stuff from American dealers, especially car makers. So I bought real heavy, a lot of stuff, doubles and triples, then I resold stuff right away and made money here. Then all of a sudden you couldn’t get anything anymore, and now they’re buying stuff back. 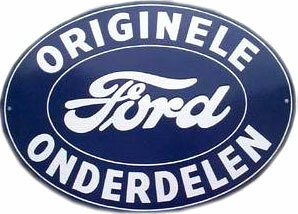 Originele Ford Onderdele porcelain sign. From Holland, 1940-50s. There just isn’t anything available in Europe in Ford stock. Each one of those countries had only like two or three dealers in the whole country. Not like here, where in every little city they had a Ford dealership. Ford dealers came to Europe more heavily after WWII, but were there before that as you can see from early Ford magazines. They had one called Ford Times that was put out since 1908 or 1909. They show the agencies over in Europe, and all over the world. You can see Model T’s in China. They had regular agencies and right out in front you can see one of the old Ford signs. Collectors Weekly: What about keys and other collectibles? Baker: I have some Model T keys, and some antifreeze cans from the ‘20s. 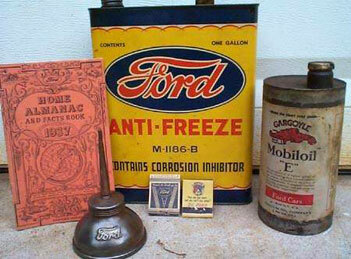 Ford sold their own motor oils, and their own antifreeze with the Ford name on it. They sold their own paint in glass jars with Ford written on them. Other stuff – different greases and the like. If you bought a fan belt it would have Ford written on it, you were always needing something. All their parts had their name written on them. And it is all collectible. I forget how many keys I have. In the Model T’s they numbered them, starting with fifty something and ending with seventy something, I think there are 24 different keys. With those 24 different keys you can start any Model T in the world. They didn’t sell a whole lot of cars back then, so they would issue one of each or maybe two of each. That means there are a lot of people out there that have those keys. All you got to do is find somebody that has the same number stamped on the key and you can drive their car. The 1927 would be the last Model T, and they used those keys probably from the early 1920s. I guess they were cheap, they figured you didn’t need something special, it was a different era. In that era if somebody stole a car they would go out and shoot them. Everyone would know. I also have an old Ford gas pump globe. It got wings on it and the universal claw, it’s cracked but it’s an original piece. In the condition it’s in it may be worth $1,000, but if it wasn’t cracked it would be worth more… one sold recently for $15,000. There aren’t but a handful of them throughout the country, they were in agencies where they had the parts department. They would be on a little pedestal, just a light, it wasn’t like it was gas or anything it was just a globe for their parts department. There are more of them in California than anywhere else. The big collectors of globes, gas pumps and signs came East and bought them and took them out with them. I think that there maybe about six good ones. Collectors Weekly: Tell us about your Petroliana collection. Baker: I collect all kinds of pumps, all different models. I collected Richfield as a brand but only East Coast Richfield. Here on the East Coast they put out the rain globes and all those signs, that is what I’ve collected. The West Coast Richfield’s had their own globes. At first I collected the regular gas pumps that weren’t rare. Then I got into the ones that had fancy mechanics, those ones you had to step on. Then there are the ones called “display pumps” that have a thick glass case with the meters on top and then the globe. The case would have glass doors, locked, and in there they had oil, different waxes and all kinds of fancy stuff. When you went to get your gas, people would see all of this stuff and say “oh give me a can of that wax.” They just had dummy ones in the pump, they would go inside and get a can of wax or whatever they bought. These “display pumps” are extremely rare, and I had a big collection of them. They were my best pumps. They were rare because in the 1930s, most service stations couldn’t afford a pump like that with their own name on it. If they went with the company’s cases the company would put in cheap pumps and maintain them. So why would you go and buy a big pump, where if something happened, you had to pay yourself to have it repaired. Not a lot of station owners would put out that extra money, and none of the big oil companies were going to buy them. They just couldn’t see them making any more money. It’s really the uniqueness of stuff like that I like. Some of these pumps you know you would hand crank them, and it would not only register how many gallons you pumped, but also what the price was, and it would keep changing. Some of them had some really neat mechanics, all of these gears working in there. Collectors Weekly: How did you become so interested in Richfield? Baker: Richfield started out as a California company. But right around when the stock market crashed Richfield bought out a big refinery out here on the East Coast. Because the company collapsed in the stock market, they bought it up real cheap and then started selling their gas here. It was Richfield out of New York City, but still part of the California Company. In ’29 they started selling gas. Porcelain Richfield Ethyl sign from New England. When I started searching for gas pumps this guy told me about this one place, I think it was a distributorship for all different gases. I went down there and what he had is Tydol if you have ever heard of that gasoline brand. They had Tydol globes and Richfield globes. Well in one spot they had all of the faces laying in boxes, but they didn’t have the metal rings. They looked like a blue shield, with yellow around it. 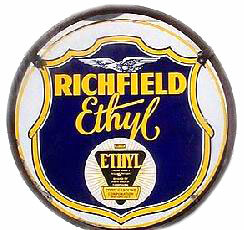 One version said Richfield the gasoline of power, and the other said Richfield Ethyl. I bought like 200 of the faces, and half of them were Richfield, so I started to collect Richfield. That was our biggest find in collecting, finding all of these globes. I still paid several thousand for what I bought, and that was 40 something years ago. Today a pair of those faces, the better Richfield ones, are worth $3,000, just the faces. Collectors Weekly: Back to Ford for a minute… what can you tell us about clubs for Ford collectors? Baker: In my area we have a local county branch of the Antique Automobile Club of America. There are also other clubs in the area, which I don’t belong to, like the South Jersey Fifties Cruisers Club. In terms of national clubs, I belong to the Early Ford V8 Club of America, and the national AACA club, because you have to belong to the national to sell at Hershey. I have a spot at Hershey I could give you that spot number, OBC1213, and offer that if any of your readers has any questions about Ford signs or other Ford collectibles I would give them the free information at the fall show. I will be glad to help them out in any way that I can. I will be on the orange field. Collectors Weekly: How about other good resources or advice for Ford collectors? Baker: Nobody has really ever put a book out on just Ford signs. Just keep going to shows and learn it for yourself. eBay is a good thing to keep your eye on but, don’t buy the first thing you see, I often see signs on there I don’t think are real. It is really hard to tell. 1932 Ford 3 window coupe – Steel body, original 1950’s Hot Rod condition. I’d say collect what you like, you have to really like it, and then try and get as much information as possible before you buy something. Ask a couple of other people’s opinion when you are buying a sign to at least know what is real. Even in the porcelain stuff out there, there is stuff that looks wonderful, and it’s not. With signs the biggest thing is condition. You pay more for better condition, don’t pay cheap for something that is bad. In the long run when you buy the better sign you will make more money and you will be able to sell it a lot faster. Get the best that you can get. The same is true for Ford cars. If you see a Roadster with a pretty good body and a four door sedan with a good body, you might want the sedan because it is a little bit cheaper. But when you go to restore it it will cost you the same amount. And the end product the Roadster may be worth three or four times what the restored sedan is worth. When you make the original buy you ought to think what is it going to be worth in the end. We would like to know more about our 1946 Ford Super Deluxe 4 dr sedan.Others tell us it is a Special Deluxe since it has green tented glass, spotlight, heater, and a 3rd horn on the right. Title reads Super Deluxe only. I would also like to know if there is a way to find out who was the first owner when it left the assemble line. Thanks, and hope you can help. I need to know what a 1946 Ford two door was sold for new in 1946. I need this information for accuracy in a book I’m writing. Thank you for any help you can provide. I have a ford car key from my grandfathers first car he owed, but I would like to know more about it and I can’t find nothing like it anywhere. The markings on the front say:P. A. Hartley, ST. Charles, Mich, Phone s6 F. 2. The key is like a folding knife that you pull the key out so you can use it. The only thing I remember my grandfather telling me about it was it belonged to the first car he owed. Can you give me more info on the key and if it’s worth something, and what kind of car it may have belonged to? Good article. A classic car is a priceless possession, and its, worth is well known to the person who owns it. But then again a classic car cannot be insured the same way as a regular car. This is because; these are valued much differently than the newer vehicles. The classic car has to be maintained regularly because they are one of the best cars around the world. And thanks for the information Maribeth. Wow! The classic cars are amazing. The Ford Cabriolet is really one of the amazing cars and this has a good engine speed and has good performance. I have a 1965 Ford Galaxie 500 that my grandfather gave me when i was 16. It is all original, has the original owners manual and in the body is in excellent condition. It has a 352 engine in it that still runs with original ford gold plated valve covers. My grandpa always told me if i sold the car to keep the motor. Im in the military now and have no time or money to complete this project car. I could use the money for the holidays for my family so i am looking to sell it. Please let me know if you could help me out in any way. Thank You for your time, Sincerley Johnathon. 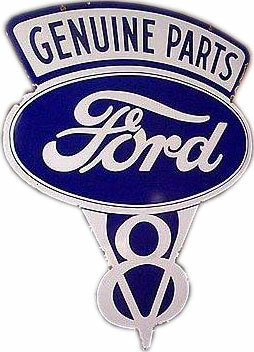 Thank you so much for helping me research my old Ford sign. It’s always nice to run across people who have a passion for what they do and are willing to share it with others. Best of luck to you, and happy hunting! My great uncle was a Ford Lincoln Mercury dealer for over 50 years. He inherited part ownership of the original Ford Dealership in the Middle 30’s. After he died his estate was divied up and I got a bag full of costume jewlery. His service awards from Ford included a 25 year Ford Lincoln Mercury cuff links and a 50 year tie pin. An interesting award that might have been personally given to him by Henry Ford is a pair of 14K gold cuff links with a 1903 Ford Model A Runabout with tiny red stones for head lamps. Possibly the previous dealership owner may have given the model A cuff links to my uncle. If anyblody has info on these cuff links I would appreciate hearing it. To me the cuff links are worth more than the 14K gold. “ ” A sweet aphrodisiacal scent filled the air. The aroma, cooped up inside a bottle for ninety-three years, rushed out.